FC Sonora was created in 2010 with a vision to provide a Youth Developmental Program focused on development of skills, game understanding, and love for the game. This gives players a solid foundation well before entering competitive play. 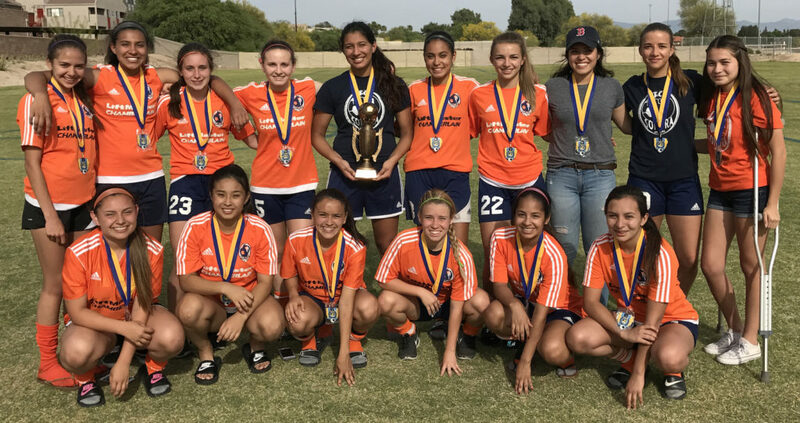 The FC Sonora competitive program looks to field teams in the U13-U19 age groups. Waiting until U13 or U14 before focusing on the issues of competitive youth soccer, allows our club’s players to concentrate on development of individual skills, while learning and enjoying the game. Rather than reaching U13 burned out on a game that had consumed their childhood, FC Sonora programs are designed to maintain the player’s love of the game, and have them eager to commit to a competitive program when they have reached a physical and cognitive maturity that is ready for the rigor of a competitive team. When forming a new FC Sonora competitive team, the club will hold open tryouts. In subsequent years, invitational tryouts will be held to fill empty spots created by players leaving the team because they no longer have the commitment to the rigors of competitive soccer. The philosophy of FC Sonora is that winning a championship is a goal; however, it is not such a priority that players would lose their spot on the team, just because another player, deemed better, wants to join. Team chemistry developed over the years goes a long way to creating champions, as well as lifelong friends. If we truly want a commitment from our players to FC Sonora, then we must also make a commitment to them! Training: TBD – Team forming for 2019/20 season!